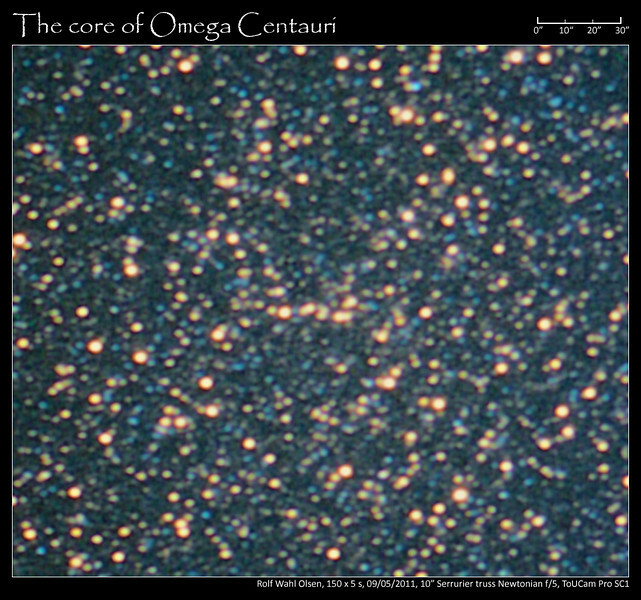 Omega Centauri is by far the most massive of the about 150 known globular clusters in the Milky Way. About 10 million stars orbit the center of this cluster. It spans about 150 light years across, and is located some 15,000 light years away in the southern constellation Centaurus. It is easily visible to the naked eye and was first cataloged as a star by early astronomers. Also visible are large numbers of blue stars of a uniform medium brightness. These are 'blue stragglers' - stars that are too hot and massive for the cluster's otherwise old age. Given the ancient origin of the cluster these stars should have turned into red giants by now but it has been proposed that they are the results of mergers and mass transfers in the crowded environment of globular clusters. A main sequence star can exist for billions of years in the cluster and then later gain mass from a close orbiting binary, or as a result of a collision/merger, and thereby become more massive and hotter so that it now appears as a blue giant. The image is stack of 150 x 5 seconds taken with ToUCam Pro SC1 and 10" Serrurier truss Newtonian with no filters.